AI will catalyze sea change in TMT, effecting nearly every existing consumer and business application and enabling a host of new ones that could remake entire industries (http://www.ssrllc.com/publication/a-deep-learning-primer-the-reality-may-exceed-the-hype/). Talent – scientists with the intellect, skills, and experience needed to design and “train” the deeply layered complexes of interrelated algorithms comprising deep learning systems – are one of the three key ingredients to leading edge AI (data and powerful computing platforms are the others). All else equal, companies with more talent can build more complex programs to address more complicated problems with better results in less time across more applications than the competition. Skepticism muted interest and funding in the area until the mid-2000’s, an “AI Winter” that has limited the population of true experts in the field, many of whom have been poached by commercial enterprises, constraining universities’ capacity to turn out new Ph.Ds. 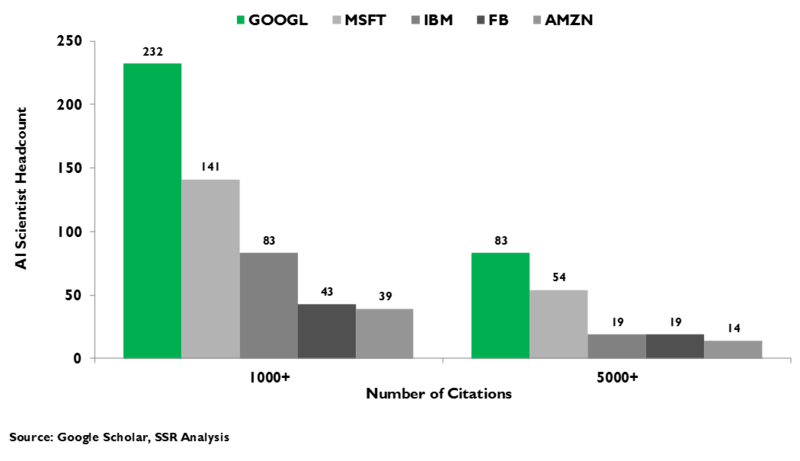 We have built a data base of over 850 of the most cited AI scientists, 44% of whom work outside of academia. #1 GOOGL has 83 of them, followed by MSFT (54) IBM (19), FB (19), AMZN (14) and BIDU (8). 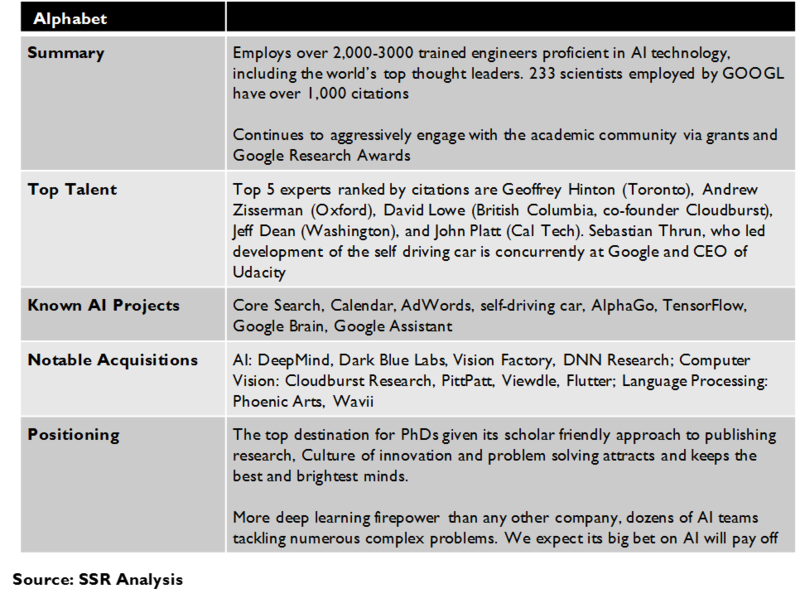 GOOGL’s roster of heavy hitters also attracts top young talent – it runs an internal “post-doc” education program in deep learning. At the recent ICML academic conference, GOOGL authors contributed 22 of 322 papers selected for presentation and won 2 of the 4 best paper awards. MSFT (17), IBM (9), and FB (4) also presented more than 2 papers. We believe that this excellence positions these companies to lead in finding broad, efficient and optimized solutions for the most promising arenas for AI, including natural language interfaces, image/video recognition, predictive modeling, and autonomous vehicles. Some companies with less talent can effectively address smaller, constrained applications, but most will have to buy AI from the leaders. Experienced scientific talent is a prerequisite for leading edge AI. Deep learning systems have three key ingredients – big data bases, powerful processing platforms, and programmers with expertise and experience in the idiosyncratic technology. Unlike traditional software, built bottom up from functional modules that can be written independently, deep learning demands an understanding of the whole system. Leading edge systems have thousands of individual algorithms, each working on an aspect of the problem but interacting with each other in layers. The program iterates over large data sets, with scientists periodically changing the individual algorithms and their relationships with each other in order to “train” the system to ever more optimal results. All things equal, companies with more and better talent can address more complex problems more completely and find better solutions more quickly. Deep learning scientists are in short supply. AI had a history of promising much, but delivering little. By the late ‘80’s, when the shortcomings of the expert systems approach had become apparent, backlash yielded an “AI winter” that lasted into the new millennium. Deep learning funding dried up, and promising CS students were steered away from the discipline. According to leading figures in the field, there are fewer than 100 true thought leaders – most already poached by a handful of companies. These experts are attracting the next tier of scientists from the close-knit academic community, concentrating talent and constraining the ability of universities to turn out new Ph.Ds. GOOGL leads for experienced talent. 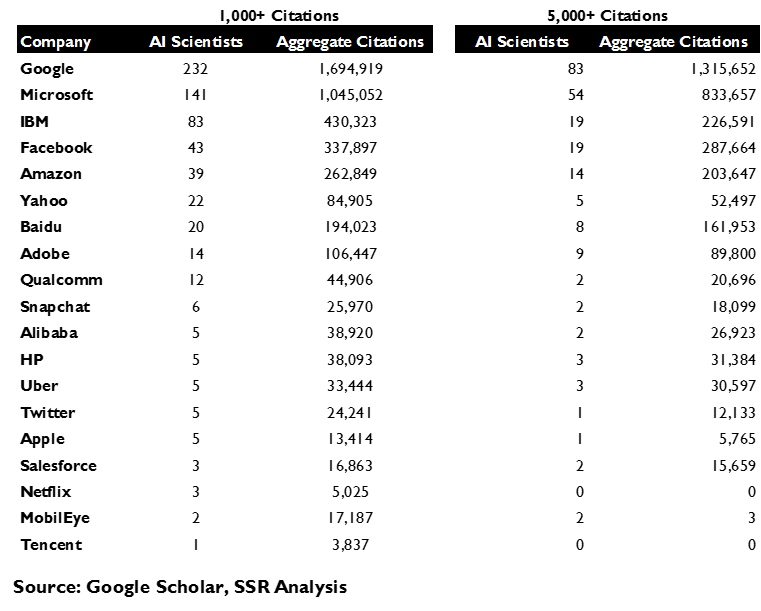 We have built a data base of thousands of scientists who have been cited by academic papers for their work in AI. Of these, 855 have been cited at least 5,000 times, a significant indicator of their experience and influence. More than 35% of these experts have left academia, with GOOGL the largest employer by far with 83. Following behind are MSFT (54), IBM (19), FB (19), AMZN (14) and BIDU (8). GOOGL’s brain trust leads thousands of AI proficient engineers spread over dozens of teams applying learning technology to existing businesses and new opportunities, while supporting highly touted internal post-grad AI training programs that supplement its aggressive hiring in the tight market for recent grads with relevant experience. Talent leadership evident in intellectual contributions. 322 papers were selected for presentation at the recent ICML conference, the top annual gathering for AI academics. 34% of the papers were written or co-written by scientists working in the private-sector, 22 by GOOGL employees, including 2 of the 4 papers judged to be the best presented at the conference. MSFT was involved in 17 papers, IBM with 9, ADBE with 5, and both YHOO and FB with 4. AMZN and BIDU each had 3, while TWTR, Hulu, and recent CRM acquisition MetaMind contributed 2 apiece, with 15 other companies presenting one paper each. Top players addressing generalized solutions. GOOGL, MSFT, FB, IBM, AMZN, BIDU, and BABA have all built extensive AI capabilities with hundreds of experienced engineers. We believe that these companies are in position to push leading edge deep learning solutions against broad, complex use cases – uncompromised natural language interfaces, translation, autonomous machines, detailed image classification, complex predictive modeling, etc. – simultaneously addressing multiple projects. GOOGL is the clear leader, but MSFT is the clear #2, with the others well behind and fairly clustered in the capabilities of their talent rosters. The next tier will specialize and compromise. Companies like AAPL, TWTR, ADBE, CRM, NEC, NVDA, QCOM, and MBLY have a handful of experts and fairly small teams of trained deep learning engineers. These companies look to leverage open source technologies with focused research of their own to address very specific applications, typically constraining the application to simplify and accelerate development – e.g. voice interfaces that recognize limited commands or self-driving systems restricted to highway driving. All else equal (i.e. available data, processing platforms, ecosystem partnerships), these companies are at significant disadvantage for the broad, complex applications being pursued by the top players. Everyone else will buy AI from the leaders. Companies in traditional sectors, like automakers, media companies, banks, telecom carriers, retailers, etc., barely show up on the lists of published AI experts. With scarce supply of trained deep learning engineers, these organizations are not desirable employers for candidates that are as often looking for opportunities to enhance their own skill sets by working with known experts as they are in grabbing the highest salary. We do not believe that any of these companies is likely to succeed in implementing significant AI capabilities on their own, and expect many of them to partner with top players to counter obvious threats to their core businesses. For companies like IBM, MSFT, GOOGL and AMZN, this could represent a substantial future opportunity. In 2014, Dr. Yoshua Bengio, one of a trio of scientists considered to be the top minds in deep learning, conjectured that there were only about 50 people who were truly expert in the technology, 12 of whom were part of the DeepMind think tank that had just been acquired by GOOGL. Given that GOOGL already had aqui-hired Dr. Geoffrey Hinton – another of that trio – two years earlier to join an AI effort already unmatched in either industry or academia, many observers posited that GOOGL was looking to corner the market on deep learning talent. While GOOGL hasn’t shut out the competition entirely – Bengio since joined IBM and the third member of the deep learning Mount Rushmore, Dr. Yann LeCun now leads FB’s AI efforts – it has a staggering lead. We identified more than 850 scientists working in industry who have been cited in papers on AI published in academic journals at least 5,000 times. Of these, nearly 10% are GOOGL employees, nearly 60% more than the number that work for MSFT, #2 with 54 of the top cited scientists. #3 IBM is well behind MSFT, with 19 scientists, pressured by fast growing FB also with 19. AMZN, #5 with 14, may be making its move, just hiring CMU faculty head Alex Smola to build an AI platform for AWS. In contrast, AAPL has just 1 scientist with 5,000+ citations and only 4 more with 1,000, all of whom have come via acquisition. BIDU and BABA have benefited from a push by Chinese universities, giving the domestic internet giants an excellent pool of young talent, albeit with fewer greybeard experts. BIDU has supplemented its Chinese AI efforts with the hire of Stanford professor Andrew Ng, who is building a Silicon Valley-based team. Companies not on the leaderboard will find it hard to catch-up. 39% of the known experts already work for private-sector companies – the rest have undoubtedly turned down commercial opportunities in favor of academia, suggesting a hard sell. Moreover, academics who have jumped to one of the leaders typically have connections to scientists who are already there, cementing collegial relationships and continuing joint research. In this way, success begets success. At the same time, the brain drain to the private sector constrains universities’ capacity to turn out new Ph.Ds, adding to the general talent shortage in the field. Less talented organizations will pursue deep learning using the well-worn tools already contributed to open source and applying them toward constrained use cases that require far less complex solutions. 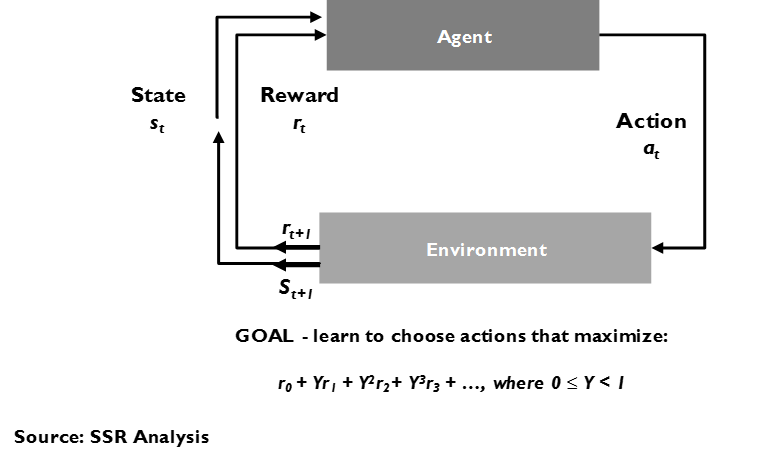 For example, a voice-enabled assistant that responds to a fixed set of commands within a required syntax is much, much easier to create than a generalized solution able parse questions however they are asked, consider the context and deliver the best possible response from all available information. In this way, a useful start does not necessarily suggest an easy jump to broader solution – a challenge for AAPL with Siri or TSLA with its highway autopilot. Meanwhile, GOOGL has dozens of deep learning teams with leadership across all of the major application areas of AI – natural language, autonomous vehicles, image recognition, gesture controls, adaptive cyber security, data driven reasoning, scientific modelling, etc. Its competition in these areas is certain to come from the other talent leaders – MSFT, IBM, FB, AMZN, BIDU, and BABA – who do not have GOOGL’s breadth, but have real strength in one or more of the application areas. We also expect the big seven to lead in developing hosted deep learning platforms, enabling them to partner with 3rd parties on narrow or industry-specific solutions – e.g. drug discovery, disease diagnostics, industrial controls, scientific modeling, financial trading, etc. Artificial intelligence is cool again. For the pioneers of deep learning, scholars who labored on through two decades of “AI Winter” when funding was scarce and promising computer science students were strongly advised into more practical fields of study, this must feel like vindication. Dr. Yoshua Bengio, who with Dr. Geoffrey Hinton and Dr. Yann LeCun, is generally considered one of the progenitors of modern AI, has said that “there are probably less 50 people who are truly expert” in deep learning. Most of those experts have been snapped up by private-sector companies, including Drs. Bengio (IBM), Hinton (Google) and LeCun (Facebook), leaving a less experienced generation in charge at the leading university computer science programs. Even at that level, the best and the brightest have had seven-figure incomes dangled before them and only the most dedicated and/or risk averse are sure bets to stay (Exhibit 1). This is important, because well-experienced computer science talent is a pre-requisite for leadership in deep learning technology. Learning systems consist of hundreds of individual algorithms interlinked in layers with feedback loops that iterate through massive data bases looking for patterns. How quickly the system reaches a solution and well that solution performs against its objectives is heavily dependent on the design of the algorithms and the network of feedback loops, and on the many, many adjustments that the programmers make along the way to “train” the system (Exhibit 2). The job of designing and training a learning system is as much of an art as it is a science, and rewards the insight and instincts that only come with years of experience. All things else being equal, a deep, experienced AI team led by true experts will find much better solutions to much more complicated problems much more quickly. This is particularly important for the big problems being tackled by deep learning – broad human-machine communication in natural language, precise interpretations of images, machines that operate autonomously (cars, robots, drones, etc), and accurate predictive models for complex and ambiguous problems, etc. In these cases, designing the algorithms and layered networks of feedback, and then training them over endless iterations through massive data bases on problems that have vexed researches for years, requires bleeding edge expertise. Without it, organizations are forced to aim lower, truncating the problem and making it easier to come to a successful solution with modest talent and open source tools (Exhibit 3). Examples of this “truncation” abound. Apple’s Siri limits the topics on which it can take action and returns sassy banter when it cannot understand the question. Amazon’s Alexa does the same thing. Neither aspires to the generalized use case of responding appropriately to a user on any question using any syntax. MobileEye’s autonomous driving solution, employed in Tesla’s cars, is restricted to highway autopilot, where the tasks are limited to staying in a lane while avoiding the cars in front, behind and to the side and alerting the driver when they need to take over at an exit. The generalized driving case, involving pedestrians, bicycles, a wide variety of signs and signals, more erratic driving patterns, etc., is a much more complicated solution set. We believe that it will be the organizations with deep bases of experienced talent that will deliver the more generalized solutions first and best. We built a data base of the top scientists in AI, identifying citations from papers recently published by academic journals and then using Google Scholar to measure the number of other citations that each scientist had collected. While scientists tend to publish less once they have been recruited to private industry, older papers are more likely to have piled up citations, and since the very large majority of academic hires have been made within the past 5 years, we believe that the methodology fairly represents the value of the intellectual contributions made by each. We do note that while Google Scholar is nearly comprehensive in its database of English language publications, it may well underweight the contributions of scientists working in other languages. With the Chinese government having placed a priority on AI research at its universities, the talent pool working for Chinese companies may be more impressive than is suggested by our analysis. Our work has identified 855 working computer scientists who have each been cited at least 5,000 times in academic papers. Of these, 332 (39%) work for private-sector companies, including the trio of scientists widely considered to be the most important pioneers of deep learning, Drs. Geoffrey Hinton (Google – 131K citations), Yoshua Bengio (IBM – 40K), and Yann LeCun (Facebook – 34K). Leading the way amongst private-sector companies, Alphabet has 83 AI scholars with more than 5,000 citations and 232 with more than 1,000. Microsoft is a clear number two with 54 scientists in the 5K club and 141 with 1K. Behind the top two, there is a substantial gap to number 3 IBM (19 5K, 82 1K), number 4 Facebook (18 5K, 43 1K), and number 5 Amazon (14 5K, 34 1K) (Exhibit 4). Behind the top 5, #6 Baidu (8,20) and #11 Alibaba (1,5) stand out, as each likely has unmeasured strength in AI due to the limitations of Google Scholar and its western language bias (Exhibit 5). #7 was Adobe, which has quietly built a team with 9 scientists with 5,000+ citations, and 5 more with more than 1,000. We surprised at #8 Yahoo’s continued presence in the top 10, with 5 scientists with 5,000 citations apiece amongst 22 with more than 1,000. This puts Yahoo well ahead of companies like Apple (1,5), Uber (3,5) and Netflix (0,3). Qualcomm also shows in the top 10 with 2 5K citation scholars amidst 12 topping the 1K benchmark. Snapchat (2,6) fills in the list at #10. Uber, with 3 5K scientists amongst 5 with 1,000+ citations is a close #11, particularly given its research partnership with Carnegie Mellon University. MobileEye, which only has 2 scientists on the 5K list, has a similar relationship with Israel’s Technion, where its founders had been faculty members. Twitter’s recent acquisition of London-based image processing start up Magic Pony and its 11 Imperial College trained Ph.Ds brings young talent, although few have publications beyond their Ph.D. theses and none have more than 600 citations. Still, Twitter (1,5) was already #12, essentially tied with the much larger Apple, which also has one 5K citation scientist of its 5 1K. Apple is a curious case. 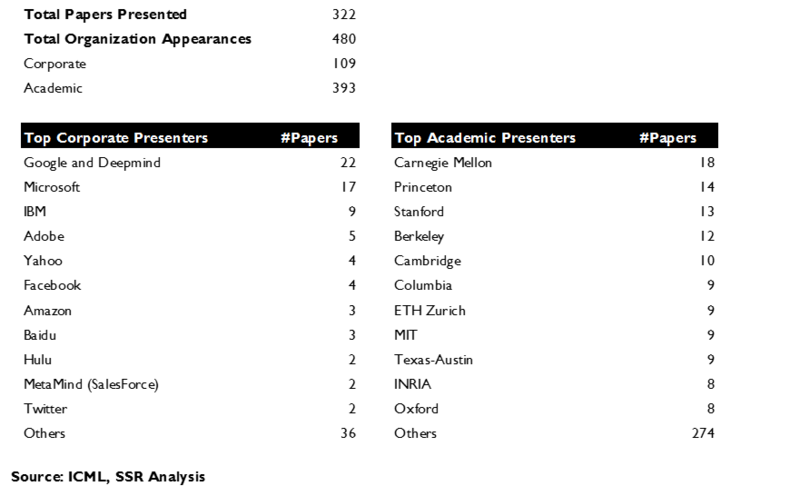 It does not allow its employees to publish academic papers or to present at conferences. This strict secrecy has been a substantial impediment to attracting and retaining senior talent, most of whom value their professional relationships within the AI academic community. Apple’s 5 well cited scientists all arrived via acquisition during the past 2 years, with experienced talent from previous deals, such as Siri, having already left the company. Still Apple has been very aggressive in hiring newly minted Ph.Ds with the hope that less experienced talent will be sufficient. At the recent International Conference for Machine Learning, essentially the Superbowl for AI academics, 322 papers were selected for presentation from thousands that had been submitted. 22 of those papers, including 2 of the 4 awarded “best paper” citations, were presented by Google scientists. The number two organization was Carnegie Mellon University (18), followed by Microsoft with 17. The next 5 organizations with the most presentations were all universities, with IBM showing tied for 9th place with 7 papers. Adobe, with 5 papers, was tied for 21st, while Yahoo and Facebook, with 4, were tied for 26th. Amazon, Baidu, NEC, Sony, Twitter and Salesforce.com’s recently acquired MetaMind each presented 2 papers, and 15 other private-sector companies presented a paper apiece. This distribution is fairly consistent with our citation analysis, and almost certainly understates the progress that has been made in corporate research but held back from publication for competitive considerations. We also note that scientists working in industry have considerably less incentive to publish than their academic counterparts. As such, it is impressive that nearly a third of the presentations, including half of those given “best paper” awards, were made by employees of for profit companies (Exhibit 6). Alphabet – Search is a natural fit for deep learning technology, which can help to accurately interpret the meaning of search queries and sort through mountains of web content to find the most relevant matches. No wonder then, that Google was on it early and hard. Google wove AI into its products. Search began anticipating queries from just a few letters of typing. Gmail began noticing appointments and slotting them into Calendar automatically. AdWords got sharper at matching ads to users based upon their inferred interests. All of this was the result of the infusion of deep learning across the organization (Exhibit 7). In 2009, Google launched its self-driving car initiative. In 2011, it began the Google Brain project, which resulted in image recognition technology that taught itself to identify cats (amongst many other things) in YouTube videos without specific training. In 2013, it bought DNN research and with it, acquired Dr. Geoffrey Hinton – considered the dean of living AI scientists. Later that year, it bought Deep Mind, which had, according to Dr. Yoshua Bengio, 12 of the 50 true experts in deep learning technology. The Deep Mind team was behind AlphaGo, which built a learning system that beat the world champion of the extraordinarily complicated game Go. That victory was particularly special, as the system found new winning game strategies that had previously been unknown in the Go community. Now known as Alphabet, the company has 83 of the world’s 850 most decorated deep learning experts, accounting for a quarter of all such scientists working in the private-sector. It has another 150 or so with between 1,000 and 5,000 citations, and, according to Dr. Jeff Dean, the head of Google Brain and the chief architect of the company’s underlying software infrastructure, a few thousand of Alphabet’s 25,000 engineers are proficient in the tools of deep learning. It has created internal training programs to get many more of them up to snuff, while giving its best and brightest the equivalent of on the job post-doc fellowships with some of the top minds in the field. This is considerably more deep learning firepower than any other company can bring to bear, allowing Alphabet to have many dozens of AI teams working on projects in every corner of its business. It has the breadth and depth of experience to pursue the big problems – true human-machine natural language communications, flawless translation aware of nuance and context, autonomous vehicles and machines able to make smart decisions in ambiguous circumstances without error, and accurate predictive/diagnostic models working from extraordinarily complex data. It also has the spare capacity to work on less ambitious initiatives – better navigation, a more capable virtual assistant, ever more nuanced search, better ad placements, improved content recommendations, an enhanced online shopping experience, etc. It has also developed a deep learning platform technology (TensorFlow) and has begun selling it as a service to enterprise customers. 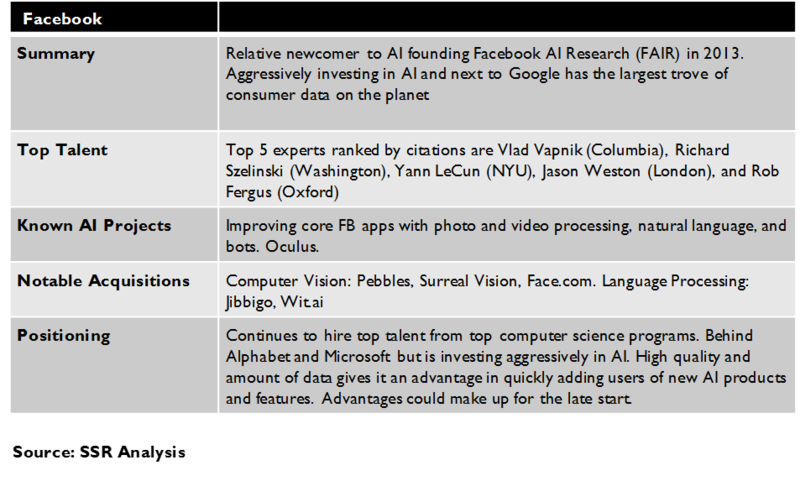 We expect Alphabet’s big bet on AI to pay off in these areas and in new applications yet unforeseen. Microsoft – Microsoft has also been involved with AI for a long time. At the very least, Bing demanded it, if it was to remain even remotely competitive with Google Search (Exhibit 8). The Xbox Kinect, announced in 2010 complete with gesture and speech recognition, was an early benchmark for more modern AI-infused interfaces. In 2015, it announced the HoloLens system for augmented reality displays that can interpolate computer generated images directly into the user’s field of vision. Quietly, the company has grown its senior AI staff to 54 scientists from the 5K citations list, with another 89 with between 1K and 5K. Overall, Microsoft research has hundreds of engineers with deep learning experience, far behind Alphabet, but well ahead of anyone else. It has focused its research somewhat relative to Google – Microsoft has taken a pass on self-driving cars, drones and robots – but has considerable strength in natural language processing, gesture recognition and general image processing, and predictive modeling. We expect the company to exploit the data gained via its LinkedIn acquisition to feed AI systems that may help enterprise customers better understand work flows within their organizations, and identify sales opportunities and personalize customer service outside their boarders. Microsoft is also planning to offer AI as a service on its Azure platform. IBM – IBM has a long, long history with AI (Exhibit 9). It was a champion of expert systems during their heyday, culminating in Deep Blue’s 1997 victory over world Chess champion Garry Kasparov during the midst of the “AI Winter”. IBM built up its deep learning chops on its next quest, building a computer system that could beat all comers at the TV game “Jeopardy”. All along, IBM has been hiring AI talent, even as it has shed employees from nearly every other aspect of its business. Big Blue now has 19 scientists in the 5K citations club, led by Dr. Yoshua Bengio, the deep learning guru hired in 2014 and currently splitting time between the company and his tenured chair at the University of Montreal. Another 63 scientists sit in the 1-5K category, leaving the company as the clear number 3 on the talent rankings list. IBM’s focus is on creating a generalized platform service, featuring leading edge natural language processing, image processing and predictive modeling tools, and making it available to enterprise customers as a service or an on-premises solution. The Watson program, the extension of IBM’s Jeopardy winning computer, is the visible face of IBM’s play to remain relevant for the next generation of enterprise IT. Given the surfeit of companies positioned to address the needs of traditional enterprise – really just Microsoft, with Google and Amazon more likely to be self-serve platforms – AI could be the ticket for IBM. Facebook – Facebook is a relative newcomer to the AI game, stepping up its game just over the past 4 years (Exhibit 10). It has made up for lost time, luring Yann LeCun – the third member of the Hinton-Bengio deep learning Jedi council – to jump start its efforts with his team from NYU. Today, Facebook has 18 scientists in the top category, and another 25 with 1K-5K citations. Facebook’s deep learning efforts are fairly concentrated against image processing – important given the huge collection of photos and videos it hosts – along with natural language processing – critical for the customer service bots that the company envisions as its next leg of monetization. We expect Facebook to be aggressive on the acquisition front – it was outbid by Google for Deep Mind in 2013, but can leverage LeCun’s web of relationships across the industry and enviable data assets to lure both startups and academic hires. Amazon – Like Facebook, Amazon is also a relative newcomer to AI (Exhibit 11). Always secretive, Amazon has only allowed its employees to publish papers and present at conferences since early 2015. This has helped quite a bit in recruiting, and Amazon’s highly cited Ph.D. count has soared to 14 with 5K+ out of 39 total with more than 1K. In the last month, Amazon scored a coup by luring Alex Smola, who had left Google in 2014 to head up Carnegie Mellon University’s AI program, to lead a new initiative to build an AI hosting platform for enterprise customers atop the AWS infrastructure. We would look for him to poach additional talent to his side. Furthermore, Amazon has a very pragmatic deep learning program at work, with particular focus on natural language interfaces. The Alexa home assistant is the product of that work, and it is notable that Amazon was able to put its version into the market well ahead of its competitors. It seems very likely that Amazon has incorporated deep learning technology into its vaunted logistics operations, and it has invested in robotics, including drone delivery. 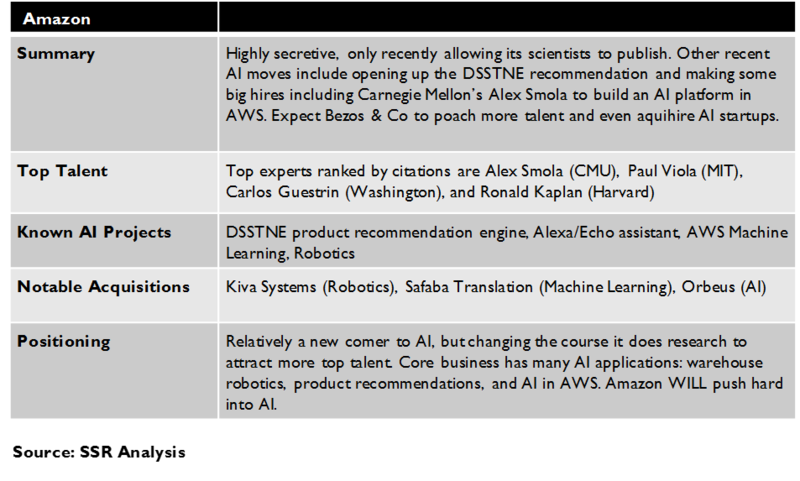 Amazon recently contributed its DSSTNE deep learning platform library into open source, in an effort to push its internal approach as a broader industry standard. Bezos appears to be dead serious about pushing Amazon hard toward AI – it may be folly to bet against him. Baidu, Alibaba and Tencent – Of the three Chinese internet giants, Baidu has made the most obvious commitment to AI. It recently hired former Google visiting scholar Andrew Ng out of Stanford University to head its Silicon Valley AI lab, and can boast 20 scientists with more than 1,000 citations, including 9 with more than 5,000 (Exhibit 12). As we have noted previously, our methodology relies on the Google Scholar citation service, which has much less complete coverage of non-English academic publications, which may undercount well-trained Ph.D.s from Chinese universities working for Chinese companies. This may explain the relative dearth of identified talent at Alibaba – just 5 1K scientists with 2 over 5K – and Tencent – just a single employee with at least 1K citations. We suspect that both companies are better stocked than that. Yahoo, Adobe and Qualcomm – These three – at numbers 7, 8 and 9 on the AI talent leaderboard – are a bit of a surprise. 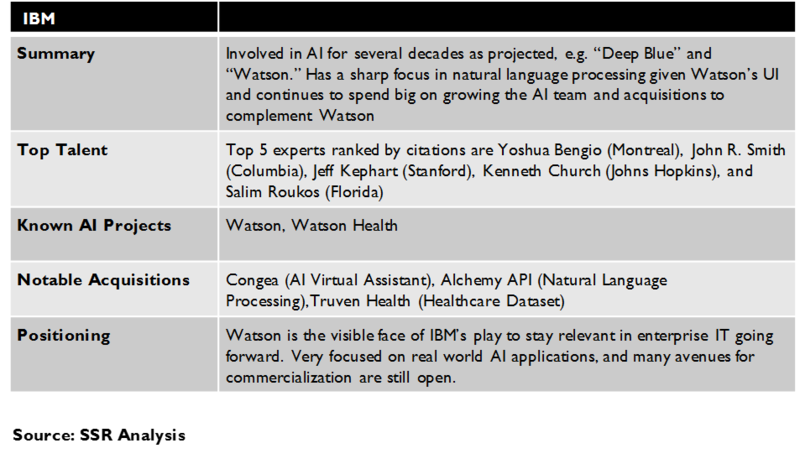 In particular, Yahoo, which has seemingly bled management and engineering talent during its multiyear death march, has held onto its AI heavy hitters, with 5 scientists with more than 5,000 citations and another 17 with between 1 and 5K. That is far more than companies like Apple, Uber and MobileEye, that have been often touted as AI leaders. Similarly, enterprise software developer Adobe has an unexpectedly robust 14 scientists on the 1K list, with 9 of those topping 5K and 4 of those topping 10K. Given Adobe’s leadership in enterprise computer graphics software, we would assume that this represents a heavy emphasis on image processing. Finally, Qualcomm boasts 2 scientists with 5,000 citations out of 12 with at least 1,000. This would seem a natural extension to the company’s business in graphics and central processors, perhaps working for turnkey software to package with its system-on-a-chip products to support learning applications on device hardware. Snapchat, Twitter and Apple – Snapchat has 6 1K scientists, of which 2 have at least 5K. Apple and Twitter both have 5 and 1. Snapchat’s AI talent, much of it acquired with Looksery in 2015, focuses on image recognition, and in particular, interpolating graphics directly onto photos and live video. Faceswapping, selfie animation, and other popular features on the platform incorporate deep learning. Twitter acquired another AI startup earlier this week in Magic Pony, and also appears to be focusing on video processing and image recognition as it grows its AI team, obvious extensions to the company’s ambitions. Apple is the curiosity of this group. With the Siri voice assistant increasingly featured in its platform, and with ambitions for self-driving cars and other major AI initiatives, Apple seems short staffed with just 5 scientists in the 1K citation category with only one of those with more than 5K. Apple’s secrecy – it doesn’t allow its employees to publish academic papers, to present at conferences or to collaborate with others outside the company – is a disadvantage in recruiting deep learning experts who value their collegial networks and have ample opportunities to work for companies that would encourage them to remain active. The scientists that Apple does have were added with acquisitions, putting the onus on it to retain them once their financial lock-ups are complete. The founders of Siri left to found a new voice assistant start up – Viv.AI – and Apple needs to avoid similar situations with its current AI leaders. Uber, MobileEye and Netflix – Uber and MobileEye both have serious ambitions for the emerging self-driving car market. Uber, caught unprepared as Google pressed forward with its program, made a bold move to recruit several leaders from Carnegie Mellon University’s highly regarded robotics program and then cut a partnership deal with CMU to fund research by faculty members that remain. Uber has 5 1K citation scientists, 3 of whom have more than 5K, supplemented by its CMU partnership. MobileEye, which produces the AI smarts for Tesla’s highway autopilot system, has deals in place with several automakers to pool data to strengthen the AI behind its product. This development is led by just two former professors from Israel’s Technion Institute, but leverages grant relationships with several others and a well-coordinated team of younger engineers recruited directly from university programs. Netflix likewise has a junior team – just 3 1K scientists – tightly focused on a single project – video content recognition and classification. Salesforce and HP Enterprise – Salesforce jumped into the AI game with its acquisition of deep learning think tank start up MetaMind and its CTO/Founder Richard Socher, a member of the 5K club. Socher, now Chief Scientist at Salesforce, brought about a dozen promising young Ph.Ds with him, although none were experienced enough to crack the 1K level. It will look to counter Microsoft’s moves to use its AI expertise to lever LinkedIn’s connections data to integrate predictive modeling and social selling into its competing CRM product. 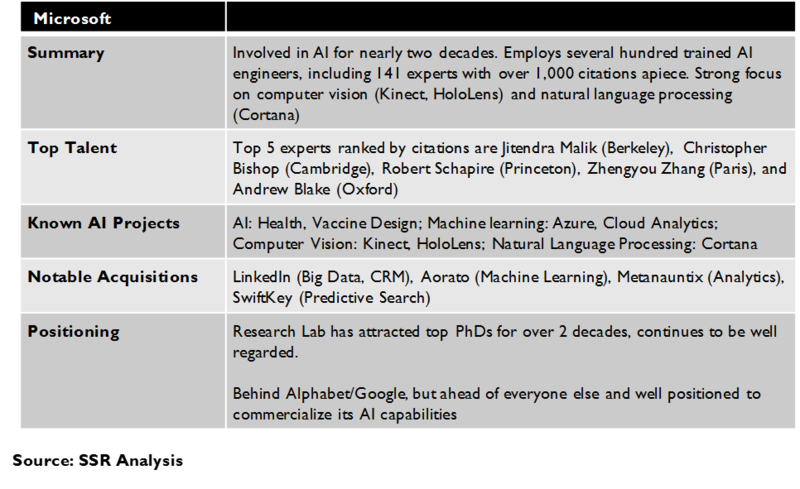 HP Enterprise has a team of 5 senior AI scientists, 3 of whom have topped 5K citations. This leaves them with much less capacity than rivals Microsoft and IBM to address enterprise needs with AI. Traditional Enterprise IT – Microsoft, IBM, Adobe and to a much lesser extent, HP Enterprise and Salesforce have established strong AI programs but most traditional enterprise technology vendors have not. 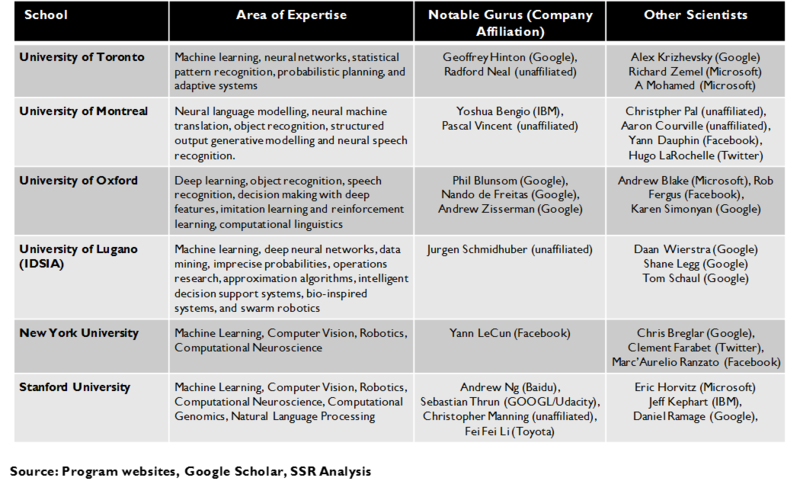 Oracle, SAP, Cisco, and others do not have well decorated AI experts to lead the development of deep learning enabled solutions for their customers. We believe that this is a significant weakness, given the potential of AI technology to enhance the analysis of “big data”. Automakers – Despite rhetoric, the world’s automakers do not appear to be arming up to compete with Alphabet, Uber and MobileEye on self-driving cars. Toyota, which provides funding to a research effort at Stanford led by the well-regarded AI expert Dr. Fei-Fei Li, has the largest commitment, but like the other automakers has no direct employees on its payroll with even 1,000 AI related academic citations – note that the “Toyota Technical Institute” is an endowed graduate engineering school at the University of Chicago with an educational agenda that does not benefit Toyota directly. This puts the industry far, far behind Alphabet (which has 7 years of experience, 2 million miles of data, intellectual leadership, and a huge team of proficient engineers), MobileEye (which is collecting data from every car equipped with its technology and a couple of heavy hitters leading the team), and Uber (which raided CMU for autonomous vehicle expertise and plans to equip many thousands of its cars with sensors to collect data). Media Companies – All of the streaming media leaders have AI initiatives, with Google, Facebook and Amazon amongst the elite in the technology and Twitter, Snapchat, Hulu and Netflix a growing presence. Not so much amongst traditional media. Disney has two 5K scientists in its Pixar division, almost certainly involved in the image processing technology used for animation. Comcast has a team of just 11 Ph.Ds, none of whom reach even 1,000 citations, supposedly staffing a wide array of initiatives in areas like natural language processing, image processing, predictive modeling, etc. None of the other major media companies show up in AI at all, but all are vulnerable to more personalized content curation, superior advertising serving mechanisms, and other applications of deep learning. Banks, Health Care, Retail/Wholesale, Consumer Services, Transport, etc. – As deep learning systems get ever more successful in delivering superior solutions for applications with ambiguous and/or extremely complicated data sets, whole swaths of the economy will be threatened by AI powered systems. Government regulation will present barriers protecting traditional industry, but these systems will gain footholds in tech friendly jurisdictions and their superiority will force acceptance globally over time. Companies competing in those sectors have time, but will be unlikely to build the internal AI capabilities needed to take leadership in managing the generational change. This represents huge opportunity for AI platform players Google, Microsoft, IBM and Amazon to power the paradigm shifts.